WOne thing I love about living in the south is winter. As in, we don't really have one. I lived on Colorado for several years and experienced my fair share of cold and snow. From there, I went to college a college where they heat the sidewalks and it would get so cold the snot in your nose would freeze. By the time our noses defrosted, class would be done and we'd have to walk back outside and freeze our faces. I have vivid memories of snowdrifts covering the first floor windows of our dorms. D and I still talk about the day when the temperature skyrocketed and we went outside in short sleeves and no coats. It was 19 degrees. This polar vortex that's bringing winter weather was normal. For reasons I cannot fathom, I opted for two more years of college in Utah. In a tourist town where people stopped before heading to the ski resort. Once, we headed to the town 45 minutes south and it was a gorgeous 75 degrees. We headed back up the mountain a few hours later where there was 6 inches of snow on the ground. I know cold. I also know whys we're experiencing right now in the gump really isn't cold. That's why I'm still wearing sandals without socks. You know I'm cold when I put on the socks! That all being said, I thought you might be interested in knowing how us southern folks are dealing with temps cold enough up cancel school... You know highs in the 20s and lows in the teens. First, everyone heads to Walmart. Because everyone is going to be stuck at home for two days! The shelves are empty of bread, giant cases of ramen and beer. Second, we do crazy things like finally wonterizing our homes. It's amazing what one can do with plastic sheeting, tape and a blow dryer. 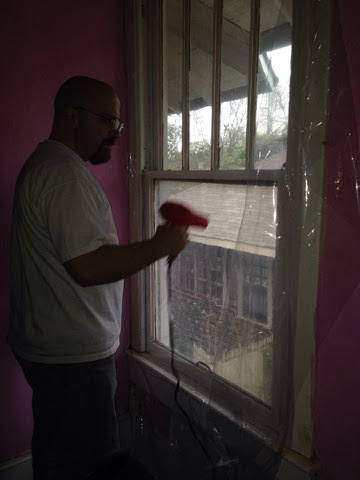 When I was a old we winterized the redneck way: a plastic tarp and duct tape over the windows. Third, we frantically figure out a way to keep the pipes from bursting. We keep the water in the faucets dripping overnight. For the outside faucets, we don't have fancy things like faucet covers. Instead, we wrap the faucets in old towels and secure the towels in place with duct tape. Finally, around our house at least, we employ my mom's old trick of baking. On extra cold days mom would go on a baking marathon. We'd hang out in the kitchen around the stove because it was the warmest room in the house. When all the baking was done, mom would turn the oven off and open the door so the heat wasn't wasted. On a similar line of thinking, I'm running the self cleaning cycle on the oven tonight and leaving the sink doors open so the pipes don't freeze. Thankfully this cold won't last long. We are going to have weather whiplash since our highs will be in the mid60s this weekend!